Today, the Permanent Representative of Antigua and Barbuda to the Organization of American States (OAS), Ambassador Sir Ronald Sanders, signed the ratification by his country of the Inter-American Convention against Racism, Racial Discrimination and Related Forms of Intolerance, adopted on June 5, 2013. The OAS Secretary General, Luis Almagro, congratulated the Government of Antigua and Barbuda for this step and highlighted the “stellar role” the country had in the negotiation of the Convention that took over thirteen years. “We hope this Convention is able to contribute to strengthening more diverse and equitable societies, free of racism, discrimination and intolerance, providing increasing recognition and protection to all human beings”, he commented. Ambassador Sanders for his part, affirmed that we would have liked his country to be the first one to ratify the Convention given the leading role played in the efforts to create the Convention. 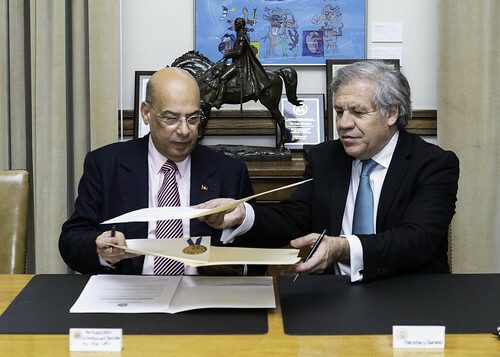 “We are still very pleased to be the first Caribbean country to do so and we expect all other countries to now become signatories, we thank you for your support to help make this effort a reality,” he concluded. The Convention, that entered into force on November 11, 2017, has been signed by twelve States: Argentina, Bolivia, Brazil, Chile, Colombia, Costa Rica, Ecuador, Haiti, Panama, Peru, Uruguay, and, evidently, Antigua and Barbuda and has been ratified by Costa Rica, Uruguay, and today by Antigua and Barbuda.